The Lower School performing and fine arts program offers a rich variety of experiences in the visual arts, music, movement, and drama. The different mediums stimulate imagination, awaken aesthetic awareness, and foster natural creativity. The curriculum in the arts classes builds multicultural awareness and integrates thematic studies from each of the grades. Performance and fine arts often provide a spontaneous language, either verbal or nonverbal, that helps to elicit what a student holds inside. Our students communicate thoughts and feelings through painting, drawing, ceramics, weaving, stitching, carving, woodworking, papier-mâché, computer graphics, and other media. In music classes, they learn progressively more sophisticated elements of listening to reading, singing, and playing music. We teach students to play Orff Mallet instruments, recorders, and guitars and to ring belle plates and handbells. Fourth graders learn the basics of choral singing. Students share their acquired skills during performances throughout the school year. Creative Movement helps our younger students use their bodies to express ideas and emotions. Units on oceans, butterflies, Japan, and Mexico provide opportunities to use drama to invite first and second graders to enter another time, place, or frame of reference. 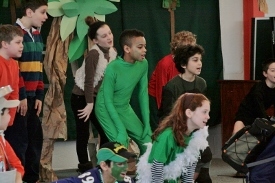 Students in Grades 3 and 4 improvise, recite prose or poetry, act out multicultural folk tales, put on plays and mini-musicals, and present choreographed performances. Even our youngest students share songs and dramatic readings with the Lower School at assemblies.